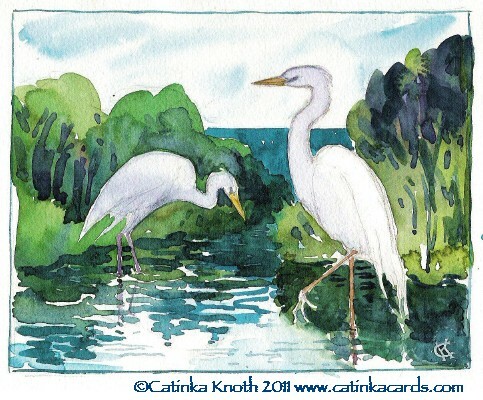 Rockland - Local artist Catinka Knoth will give a free demonstration on painting wetlands motifs watercolor art and cards at Rockland Public Library, on Monday, May 9th, 11 a.m., 80 Union St, in the Community Room. 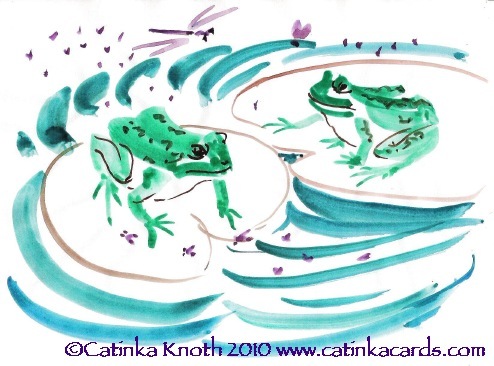 Attendees will see sumi-e inspired brush drawing in watercolor of wetlands creatures such as frogs and egrets. They will also get to create their own art drawings and cards to take home. Materials will be provided. The demonstration is sponsored by the Friends of Rockland Library. Knoth gives weekly watercolor workshops. Subjects for May will honor American Wetlands Month and International Migratory Birds Day. For more information contact Knoth at 596-0069 or visit her website www.catinkacards.com. 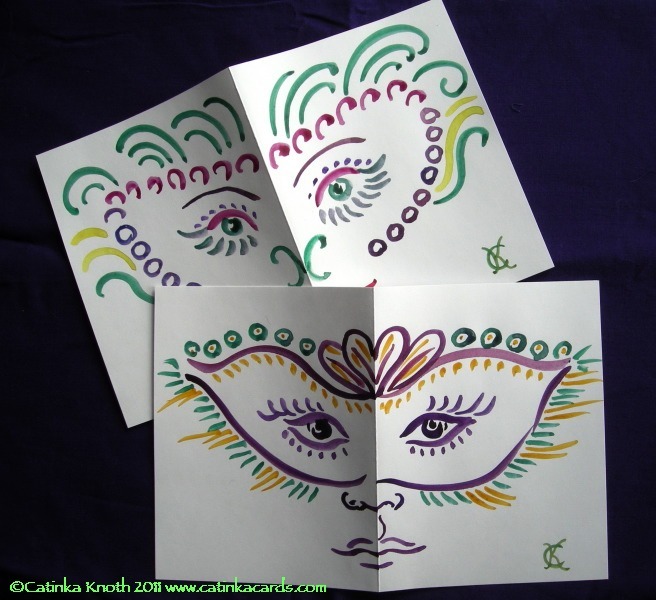 Rockland - Catinka Knoth will give a free demonstration on painting Mardi Gras mask cards. Knoth invites people to join her at the "Messy Art Room" studio at 11 a.m. on Monday, February 28, Lincoln Street Center for Arts & Education, 24 Lincoln St. Attendees will see how to paint freehand Mardi Gras masks in watercolor. The demonstration accompanies the five part watercolor workshop series, "March Motifs", that Knoth will teach on Tuesdays 10-Noon, March 1-29, at Lincoln Street Center. Each week explores a different March related subject. Participants will visit themes such as the Iditerod dog sled races, Mardi Gras, St. Patrick's Day, Arrival of Spring, and the circus. Knoth offers the series by suggested donation of $25 per lesson. Contact Knoth to confirm space, at 596-0069 or 542-7317, or visit www.catinkacards.com. 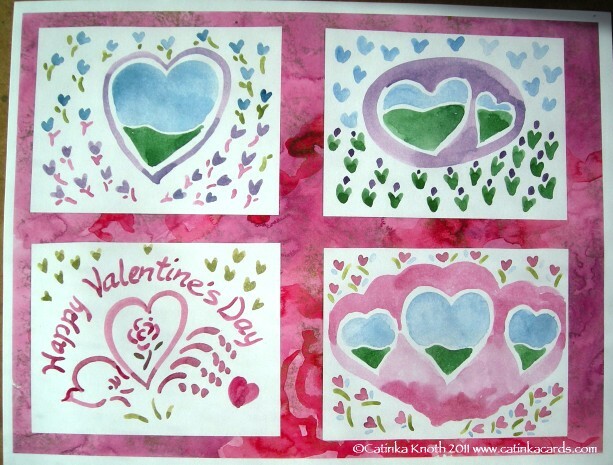 Rockland - Catinka Knoth will give a free demonstration on painting Valentine cards. Participants may join Knoth at the "Messy Art Room" studio at 11 a.m. on Monday, January 31, Lincoln Street Center for Arts & Education, 24 Lincoln St. Attendees will see how to paint freehand Valentine cards in watercolor. The demonstration introduces the four part watercolor workshop series, "February Celebrations", that Knoth will teach on Tuesdays 10-Noon, February 1-22, at Lincoln Street Center. Participants will explore painting motifs for Valentines, the Chinese New Year (year of the rabbit), Mardi Gras, and possibly Presidents' Day. Each week will be a different subject. The workshops are available by suggested donation of $25 per lesson. Contact Knoth to confirm space, at 596-0069 or 542-7317. 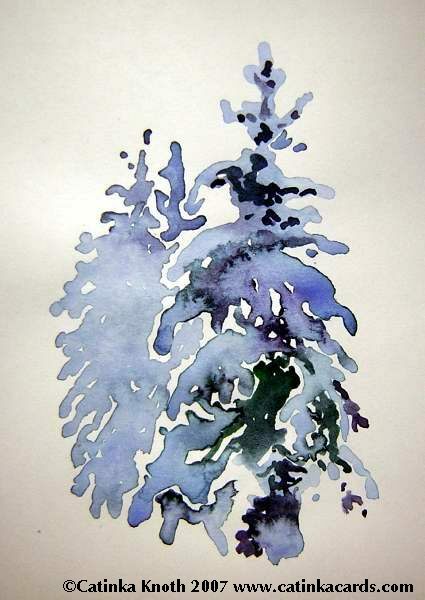 Rockland - Catinka Knoth will give a free demonstration on painting evergreen trees in snow.. Participants may join Knoth at the "Messy Art Room" studio at 11 a.m. on Monday, January 3rd, Lincoln Street Center for Arts & Education, 24 Lincoln St. Attendees will see how snowy trees can appear from the end of a brush using a watery flow of pigment over white paper. The demonstration introduces the four part watercolor workshop series, "Painting Winter Scenes", that Knoth will teach on Tuesdays 10-Noon, January 4 - 25, at Lincoln Street Center. Participants will explore painting scenes such as evergreen trees in snow, lacy snow covered branches, buildings in a snowy landscape, winter animals, and winter sports. Each week will be a different subject. The workshops are available by suggested donation of $25 per lesson. Contact Knoth to confirm space, at 596-0069 or 542-7317. 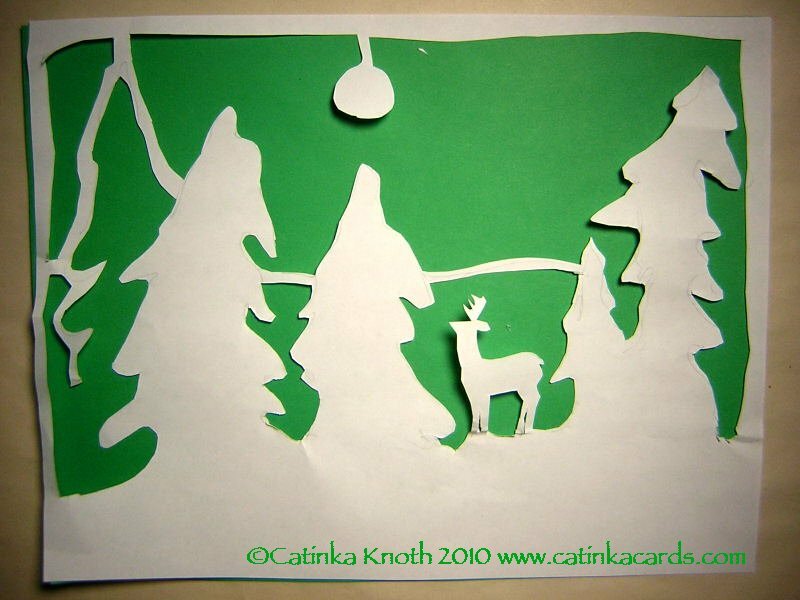 Rockland - Catinka Knoth will give a free demonstration of creating designs for holiday cards and ornaments. Participants may join Knoth at the "Messy Art Room" studio at 11 a.m. on Monday, December 6, Lincoln Street Center for Arts & Education, 24 Lincoln St. Attendees will see freehand stencil style painting and papercuts, and may try their hand at a follow-along Christmas design. The demonstration introduces the four part workshop series, "Holiday Cards and Ornaments", that Knoth will teach on Tuesdays 10-Noon, December 7-28, at Lincoln Street Center. This series uses watercolor, drawing, papercuts, and paperfolding to create paintings and cards for the holiday season, with the focus on watercolor and drawing. Each week will be a different subject. The workshops are available by suggested donation of $25 per lesson. Contact Knoth to confirm space, at 207 542-7317, or visit www.catinkacards.com.